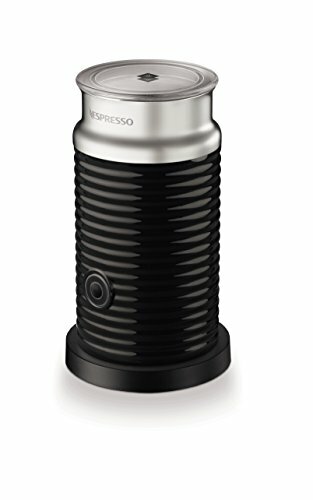 This Nespresso Aeroccino milk frother is a much more stylized piece for coffee lovers every where than the predecessors from this same brand: It’s a bit taller, it doesn’t have the large and grippy plastic handle, and the texturized finish on the outside has a nice kind of “toned-down King Cobra” appearance. The Nespresso Aeroccino milk frother just had kind of a circular vase, whereas this new and improved version has a power switch and a storage slot for the wisk that you aren’t currently using. Here are some of the fine points of this Nespresso Aeroccino milk frother that fall into the price range a bit towards the more expensive end, and is for the most part well worth it. You can even add flavored creamer to the milk, and it whips up perfectly in the main bowl. If you are very particular and want to use organic or grass-fed milks, it is widely-known that some of them don’t’ foam up quite as well as a standard skim, but the “Farmer’s Cow” brand is known to fare a bit better in this department. On the inside is a fill line that you can use as a general measurement for how much milk to put in: overfilling these types of frothers always results in making a mess, an overabundance of almost useless foam. It can even froth skim milk into delicious meringue, an awesome dessert-time delicacy and pie additive. When we brought home this Nespresso Aeroccino milk frother to our place and used it for ourselves, we noticed that the frother itself is removable, and you can remove the constantly spinning frother to use just for heat. After a few different attempts at getting the best froth to add to the beverages we love so much, we realized that using the freshest milk you can find and also the coldest will give you the best foam consistency and flavor. “we were really getting a great froth for a foamy drink just like you would find in the coffee shop”. After a couple test drives we also realized that maybe having adjustable temperature settings would help the Nespresso Aerocinno milk frother as well, as we thought that some of the froth could stand to be a little hotter, but for lattes and cappuccinos we thought that we were really getting a great froth for a foamy drink just like you would find in the coffee shop. You just have to take the whisk and attach it to the part within the unit that has a little magnet in it to keep it in place. Then you just add milk up to the fill line and press the button: we noticed that this is a very quiet unit, and that you really don’t hear much of anything while it’s working to give you the delicious froth you are after. The red light on the front of the unit goes on to show you it’s working, but the quiet factor is one we were very impressed with for this Nespresso Aeroccino milk frother. If you’re the first one up in the morning, you won’t be grinding away and waking up the rest of the house, and we deemed this unit as pretty spectacular. When the froth is done, we just held back the milk slowly while pouring in the cup we were excited to sample, and then you go back and just spoon the perfect froth on into you mixing cup or beverage. There are electric parts on the bottom that you don’t want to run through a dishwasher that connects with the base, and so always hand and water wash this Nespresso Aeroccino frother. Probably one of the best in the industry at its price point, Nespresso Aeroccino milk frother is a pretty good frother all-around that may leave you not wanting to use a manual one again anytime in the near future. Check this great article about the Breville milk frother.